In reviewing any significant piece of gear, we try not to assess any product from just one trip in the field. While evaluating the new 2010 Sierra Designs Arrow Rock 30 down sleeping bag, it was used for five backcountry trips. These trips were mostly backpacking hikes in the Sierra Nevada and San Bernardino mountain ranges of California, and the Gila National Forest of southwestern New Mexico. Elevation for all of these trips ranged between 7,000 feet above sea level to more than 11,000 feet. Fall nighttime temperatures at these altitudes varied from lows of 40° F to less than 30°, where overnight frost would settle on the tents and forest floor. The Arrow Rock 30 is a cool to moderately cold temperature sleeping back filled with 600-series down insulation. Sierra Designs rates this as a three-season sleeping bag, but it seams well suited for all seasons depending upon your shelter types and geographic region. When the mercury dropped below 30° in high elevation conditions, there was never a sense of chill or lack of warmth. Most nights, my shelter was either a Hilleberg Kaitum 3 or a Kelty Foxhole 3 four-season tent that would provide a conservative 5° of warmth as I was the only human sole in these three-man tents. Some cool nights, I’d wiggle into the Arrow Rock 30 with my Mountain Khakis flannel-lined pants on simply because it was cold and windy outside — and there was no question I’d be scooting outside before sunrise to break down camp and fire up the MSR Reactor stove for coffee and oatmeal. So for folks who tend to sleep with pants and foundational torso insulation on, this Arrow Rock 30 can keep you warm well below its rating. On nights where the temperature did not drop into the low-40’s or mid-30’s, the Arrow Rock is a roaster! There were several nights where I’d heat up in the middle of the night and zip the sleeping bag open almost the full length of the Large (for people taller than 6-foot), and just use it as a quilt since the temperature was too cold to lay on top of the bag. For this reason, and speaking for myself, this is an ideal sleeping bag for so many kinds of high-elevation or cool weather scenarios, since I could merely adjust my sleeping arrangement depending on the overnight temperatures. However, my confidence for staying warm was never shaken regardless of how cold it got under the conditions I used the Arrow Rock 30 for. This is just one of several primary qualities I valued about the Arrow Rock 30; it kept me warm in the fall, at upper elevations. A chest pocket is built in for your wallet and keys at night. The left-hand side zipper is sturdy and non-binding. Upper torso and hood offer lots of room to toss and turn. It made no difference to my perspective that 600-series down fill is used in this sleeping bag rather than the commonly regarded superior insulation capabilities of 750-to-850 premium down fills that might have been considered for this sleeping bag. 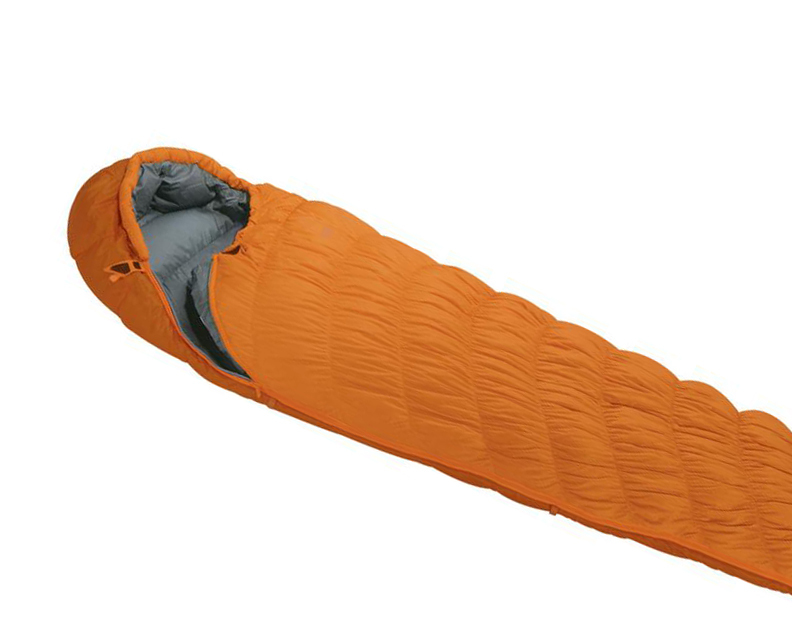 The initial price (MSRP $219.00 U.S.) of the sleeping bag would have been much greater if the higher-order down fills where used. But there’s an even more rational reason for using 600-series down insulation for the Arrow Rock 30…you don’t need any more insulation than the 600 fill provides. Another instantly recognized quality this down sleeping bag manifested soon as it was pulled out of the stuff sack was the lofting capability. Regardless of how long the sleeping bag was packed away on a trip, within a few minutes of setting up the tent and unfurling the Arrow Rock 30, the down insulation would loft-up to its full “puff.” That right there tells me, the bag is worthy of keeping me warm. The baffle-technology and the overall bag construction are design details that vary from bag to bag, and manufacturer to manufacturer. But if your down insulated sleeping bag can’t loft up within minutes of taking it out of the stuff sack, it’s a bad omen for warmth, and a confidence crusher for quality of the down fill. As a person who weighs more than 200 pounds and stands more than six-feet tall, the Sierra Designs trademarked technology called “Flex” allowed me to curl-up or stretch out in a myriad of ways without the sleeping bag binding me in. Flex allows the bag outer shell and liner material to move with the sleeper by eliminating constriction and forming to the body when lying still, thereby continuously providing warmth and maximum insulation. With it’s “mummy” style shape, the Arrow Rock 30 never presented the sense of claustrophobic restriction traditional mummy-style sleeping bags are sometimes known for. Housed in its stuff sack, the SD Arrow Rock 30 fit easily into the sleeping bag section of the Lowe-Alpine TFX Cerro Torre 65:85 backpack along with the new Therm-A-Rest NeoAir sleeping pad. Just as valuable a consideration when observing the qualities the Arrow Rock 30 offered was the pack size and weight of the sleeping bag. Mercy! Since many modern backpacks include a bottom compartment just for the sleeping bag, the Arrow Rock 30 simply rocks. No kidding here. Backpacks such as the Lowe/Alpine TFX Cerro Torre 65:85 and the more traditional Kelty Trekker external-frame pack accommodated the Arrow Rock 30 (in its stuff sack) with enough additional room for the NeoAir sleeping pad, two pairs of gloves, and a Gerber short-handled camp ax. At 2lbs, 9 ounces, the size and weight of this sleeping bag in its compact form is, perhaps, the coolest single thing about the Arrow Rock 30 if you take the warmth out of the equation. While living with the SD Arrow Rock 30 on backpacking trips, the sleeping pad that was used is the new Therm-A-Rest NeoAir. This combination of sleeping bag and sleeping pad could not have worked out better. One of the features modern down sleeping bags tend to provide are retaining straps on the underside of the sleeping bag, and the Arrow Rock 30 accommodated the Neo-Air sleeping bag as if the two were designed by the same product planning team. The Arrow Rock 30 retaining straps kept the Neo-Air sleeping pad under the bag throughout the nights, and there was never an issue with having something between my body and the floor of the tent. In writing third-party product reviews, our experience in the past 25 years has taught us that readers don’t need to necessarily want to know the technical engineering details of a product so much as they want to know if it worked, and whether there are any significant weaknesses they should consider in making a purchase decision. With the Arrow Rock 30, the overall impression is that this is a sleeping bag I’d take on any trip whether it be backpacking, four-wheel drive camping, horse back trip, or foreign travel. There were no significant drawbacks I would have you consider. So there you have it on the Sierra Designs Arrow Rock 30.